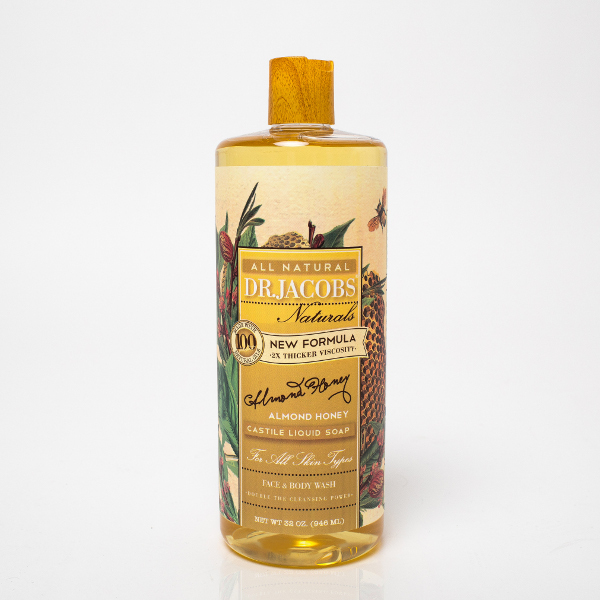 Dr Jacobs Naturals Castile Soap is available in 32 oz. liquid Castile Soap, 16 oz Castile liquid soap and in 5 oz castile Bar soap. Dr. Jacobs was a Swiss chemist that perfected the long-standing Castilian tradition of making Jabon de Castilla or Castile soap before the turn of the 19th century. Castile liquid soap is an all-vegetable oil based soap. It is named for Castile, Spain, where it is known for its olive oil. Previously, Castile bar soap was made with olive oil and animal fat. Now, liquid and solid forms of castile soap are made with vegetable oils including palm, coconut, olive, and hemp. Today, Dr. Jacobs products still use the same recipes and work to uphold the long-standing tradition of making natural Castile Soap products. The company Dr. Jacobs was created by Joey and Ezra Aini in the spring 2011. Familiar with cosmetics and skincare from other brands they have launched, they are answering the call of demand from customers for a multi-purpose natural soap product. Dr. Jacobs Naturals is 100% natural andfree of synthetic fragrances and preservatives. Their soap is pure Castile and is gentle enough for even the most sensitive skin. As an all-natural soap, made from olive oil, Dr. Jacobs Naturals will leave skin smooth and silky by forming a protective barrier. This barrier will help skin hold in moisture. Olive oil soap is the perfect addition to a regular skin care routine. As well, for customers who care for the environment, our soap is environmentally friendly. The products are completely biodegradable, free of harsh chemicals that pollute our groundwater and only use recyclable containers and do not use palm oil. Dr. Jacobs Naturals is very versatile. Castile soap can be used as an alternative to shampoo, body wash, and facial cleanser since pure olive oil Castile soap is non-greasy and will not clog pores. It can also be used as a great household cleaner, laundry detergent, and dish soap. It is also safe to clean pets! Wow! The thing that stands out the most to me about Dr. Jacobs Naturals is the wide variety of unique and natural scents of their soap! YUMMY! Did you know? Dr. Jacobs Naturals products have a 3 year shelf life from manufacturing date, although it is recommend to use within 1 year after initial use.